Here you find some results of our paneuropean study in graphics and analysis - please find further information in our book "United Dreams of Europe" which you can order at the Foundation for Future Studies via mail. When taking a closer look at individual statements, we can ascertain that Europe has much in common. For example, criminality is the unsolved problem for Europeans. Two-thirds of those surveyed – from London to Rome, Moscow to Zurich, Berlin to Madrid – list fear for their own security as by far the largest worry for the future; … Read morethus, they are touching upon an ur-European issue: domestic and foreign peace. The subjective feeling of little security in oneʼs own country can become a huge problem in future. The fear of North and Latin American relations (USA, Mexico, Colombia, etc. ), with their growing criminality and booming private security sector in which entire streets and city districts are coming together, is big. Furthermore, a majority of Europeans are worried about manʼs inhumanity towards man, complain about increasing aggression, declining honesty, egoism and intolerance, as well as growing isolation and social marginalisation. The reason for worries within this context is the fact that only one third of Europeans trust their fellow countrymen. The Dutch, Turks and Russians, above others, trust their own people to only a small degree. In contrast, the Danes have considerably less doubt in the sincerity of fellow Danes. What are the possible reasons for this? It is clear that trust has declined dramatically in the past decades. Has this been the cost of almost unlimited choices, flexibility in the labour market, of speedier and simpler divorce procedures, and frequently moving house? Within the European population, we see just a few differences – neither gender nor age has been proven to lead to significant rifts. Within the phases of life, too, those surveyed were nearly in agreement on the issue of trust. Only the group of singles showed a deep scepticism and answered the questions on trust rather in terms of a “me world”. In contrast, the young generation between the ages of 18 and 24 proved to be hopeful; they agreed that others were open and positive on an above-average level. In contrast to people’s general assessment, trust within their immediate environment has significantly regained momentum in the last ten years. According to the “World Value Survey”, the majority of people is placing more and more trust in their family and friends, and increasingly relying on those in their immediate community. … Read moreThe importance of one’s own family is confirmed upon first glance at the priorities placed in life. For 70 per cent of all Europeans, family is and remains the most important thing in life. In addition to families, older citizens, above all, agree with this statement; however, “only” about half of all singles share this opinion. An analysis of the countries shows that, in twelve of 13 nations, the majority of people agree with this statement. 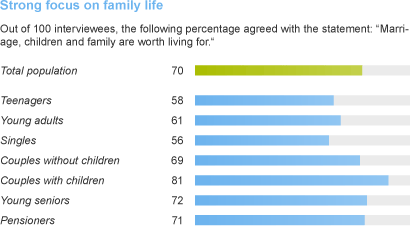 Solely in Turkey do “only” 47 per cent see family as the main focus in life. 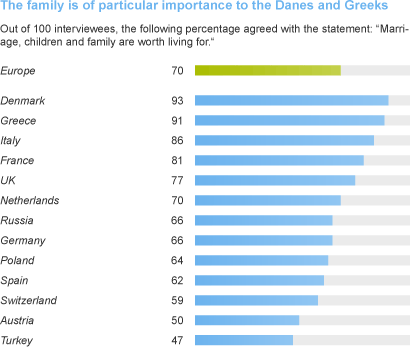 In contrast, almost double as many Danes and Greeks agree that family is the most important thing in life. In addition to family, Europeans also see their own health, friends and, playing a somewhat secondary role, nature, education and employment as the fundamental factors leading to personal well-being. Opportunities for consumption and free time do indeed remain important; however, they are no longer the main focus and are even increasingly losing in importance. In Europe, therefore, a change in attitude is taking place. Personal well-being within and with the family is becoming more important than gain in wealth. Compared to the time following the Second World War, which concentrated on the accrual of material goods, today the quest for quality of life is at the centre of everything we do. This development can also be seen in the fact that, nowadays, more than half of all Europeans (55 per cent) agree with the statement that personal quality of life (hobbies, family and friends) will be more important in future than a higher standard of living. As much as Europeans are in agreement with this statement at first count, they have different opinions about it in the individual countries. Almost as to be expected, nearly nine of ten Danes agree with this statement. The combination of an above-average income level and the simultaneous balance between career and family, which is now firmly anchored in society, enable the northern Europeans to emphasize their quality of life particularly strongly. But also in Italy and Greece, those surveyed expressed broad agreement. The time of “dolce vita” traditionally takes place within the family and circle of friends in these countries. Work is viewed more as a means to an end, and focus in life on consumer goods appears only slightly attractive to the Greeks and Italians. However, the Poles, Russians and Turks are more focused on an increase in standard of life for the future. In all three of these countries, the average income per person is currently still significantly lower than the overall average for Europe – leading to the need to catch up as a consequence. Slowly but surely, Europe’s own offspring is being threatened with extinction. At the moment, 100 women in Europe give birth to 140 children. To maintain a stable population, almost 50 per cent more are needed. Up to now, this lack of children has been absorbed by the number of immigrants to Europe. A fact which many Europeans do not know. … Read moreBut how child-friendly are the individual European states? 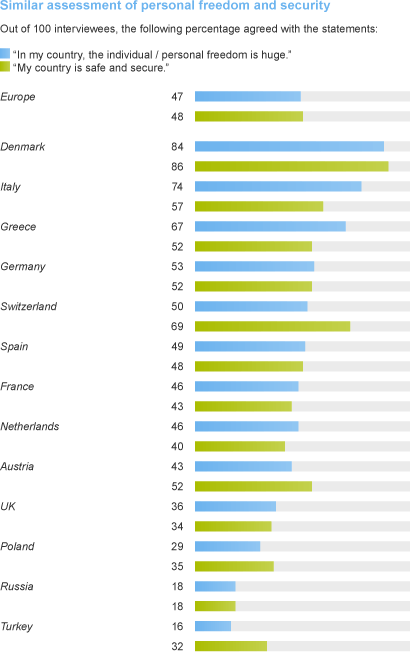 The majority of Danes, French, Greeks and Swiss consider their homeland to be child-friendly. Only every fifth Russian and German can agree with this statement. What are the reasons for this? There is a tendency for child-friendliness – as well as the average number of children – to be highest in countries where emancipation has greatly progressed. This is also generally true of nations in which the number of employed women is particularly high and traditional roles are not largely accepted by society. Likewise, the value placed on family, the number of nursery and kindergarten spaces available for children, tax breaks for families as well as the opportunities to combine career and family also play an extremely decisive role. For the future, this can only mean the political, economical and societal acknowledgement and, therefore, the emancipation of women. From this, new opportunities for the future will arise in countries in which the birth rate is presently low. In Germany, for example, this would mean strong potential for starting a family due to the country’s currently high number of females who have graduated from secondary school and higher education institutions as well as their concurrently better grades. The consequences of climate change vary around the world and include melting glaciers, a rising sea level, a growing hole in the ozone layer, heat waves and periods of drought. Europe is also feeling the effects of these changes. That is why the member states of the European Union reached a binding agreement on climate goals back in 2007, … Read moreexpressed with the formula: “3 times 20 until 2020”. This encompasses – compared to 1997 – 20 per cent less greenhouse gases within the EU, 20 per cent savings in energy and 20 per cent of the entire energy consumption generated by renewable sources. The majority of Europeans, too, are conscious of the effects of climate change and are reckoning with serious consequences for their respective homelands. The fears of the Mediterranean states, such as Italy and Greece are especially high; they are already experiencing forest fires, water shortages and periods of drought. In contrast, the people in countries such as Austria and the Netherlands, which are also predicted to experience the dramatic consequences of climate change, view environmental developments with relatively little fear. Whether higher dykes can save the Netherlands from “going under” or snow canons can counteract the lack of snow in the Alps over the long run remains to be seen and must be doubted. 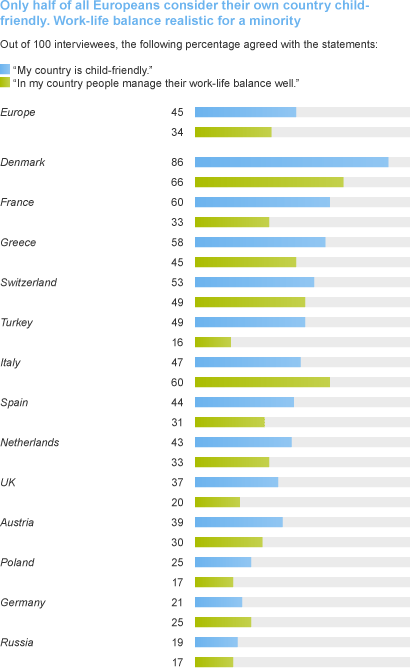 The majority of Danes, Swiss, German and French consider their own country to be eco-conscious. In contrast, Russians and Poles, more than anyone else, confirm that their home countries have little regard for the environment. This assessment has its consequences: if the people in these countries fear the effects of climate change, then more importance should be ascribed to this issue on both a political as well as a social level. Within the phases of life, singles and couples without children worry most frequently. 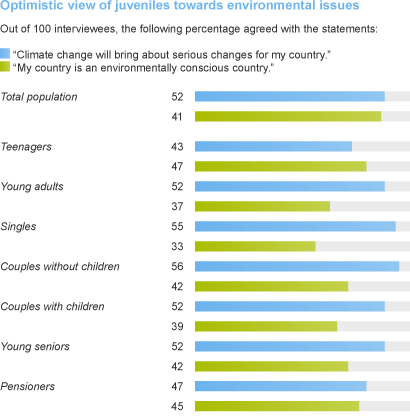 In contrast, the youth takes a relatively relaxed view of climate change – particularly male youth rarely fear the upcoming consequences. This result can be explained partly on the opinion of whether one’s homeland is “eco-conscious” or not. Singles, who fear serious consequences for their country brought about by climate change, do not see any particularly high environmental-protection actions taking place in their homeland. Youth, the majority of whom do not have any worries about the consequences of climate change, give as a reason for their relaxed attitude their belief that they live in an environmentally friendly country which is already tending to the necessary measures in good time. Voluntary commitment is indispensable for social solidarity in every society, and thus also for the future of Europe. The spectrum of options for voluntary work is extremely broad – from rescue and disaster control, patient care, nature, environment, landscape and animal protection, as well as working with children and young people, … Read more within culture and media and working in one’s free time. There are voluntary positions within politics, unions and religious environments, as well as foreign aid and human rights work, and within integration and justice, economics and labour – and probably many more areas. According to a Eurobarometer survey, 100 million Europeans are active volunteers – outside of their circle of friends and family life. If we were to include the aid provided to family and friends, this number would jump sharply. The John Hopkins University has calculated that, without personal voluntary commitment, the GDP – depending on the country – would fall by between three and seven per cent and millions of third-sector labourers would be without employment. Despite all of these facts, the importance of voluntary work is often underestimated – also because unpaid and priceless work is still not visible enough. 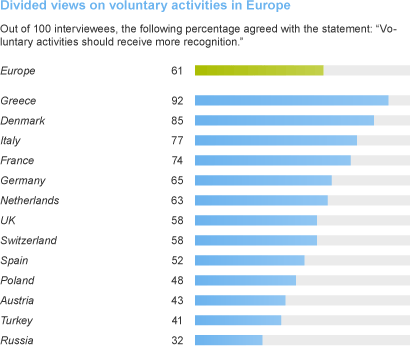 However, Europeans agree: in future, voluntary commitment has to enjoy greater recognition. Around 60 per cent of all EU citizens agree with this statement. Young seniors, childless couples and families are particularly of this opinion. The EU Commission proclaimed 2011 to be the “Year of Voluntary Work” – on the one hand, to support acceptance of voluntary work within society and, on the other hand, to show current volunteers that their work is appreciated. This official acknowledgement represents an important step in further integrating volunteerism into all of Europe. Nevertheless, this alone will not be enough to motivate people to actively participate as well as keep existing active volunteers for the long term. Material reward is also called for. This can, for example, be in the form of tax-free allowances, free admission to public museums or swimming pools, discounts for public transport, or even additional pension funds or insurance policies. 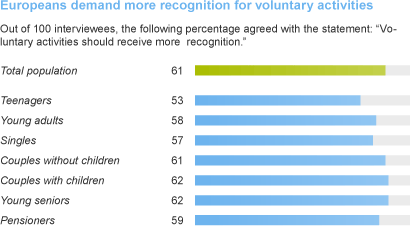 Particularly in countries where voluntary work still has very little value – such as in Russia, Turkey and Poland – those responsible should think about additional incentives. At the same time, however, these are the countries in which the people themselves see the necessity for such work to a very low degree. 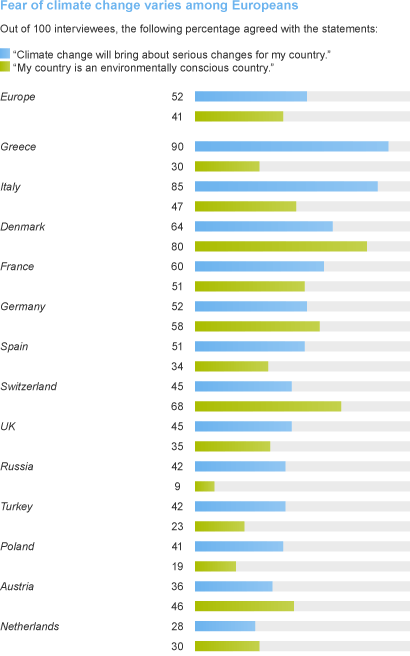 In contrast, the Greeks and Danes, Italians and French demand stronger recognition more frequently. At first glance, low concern for this topic in Austria is surprising. This result can be explained by the already very high value placed on volunteerism in this Alpine nation: no other European country has such a high number of volunteers as Austria does. In 1999, the European Ministers for Education signed the so-called Bologna Declaration with the aim of creating a uniform system of higher education by 2010 to boost Europe’s ability to compete internationally. A short time later the EU’s heads of state and government set clear economic and education goals within the framework of the Lisbon strategy: … Read moreIn 1999, the European Ministers for Education signed the so-called Bologna Declaration with the aim of creating a uniform system of higher education by 2010 to boost Europe’s ability to compete internationally. A short time later – in March 2000 – the EU’s heads of state and government set clear economic and education goals within the framework of the Lisbon strategy: within ten years, Europe should become “the most competitive and dynamic, knowledgeable economic region in the world”. With this, the aspect of education not only concentrated on higher education, but also on other learning and training needs – for example, for the unemployed, older employees or workers whose qualifications run the risk of no longer being able to meet the future needs of the job market. Among other things, concrete goals were determined: the development of local learning centres, more transparency in certifications and the support of basic skills, above all in conjunction with new information technologies. The succeeding project following on from last year, “Europe 2020”, also emphasises the importance of education by aiming to reduce school dropout rates and increase the number of university graduates, to name just two goals. Only in this way can economic growth be secured for the future and Europe remain competitive as an academic location. All three strategies point out the relevance of education: education was and is the main resource in Europe. Nevertheless, the results of past PISA surveys show the increasing necessity for further investments in education. Otherwise – and in contrast to the US, Japan, South Korea, as well as Australia, New Zealand and Canada – we run the risk of a shortage which will not be easy to absorb. However, in so far as education is concerned, a rather varied image is revealed: in addition to Europe’s “top student” Finland, the latest PISA results show that Switzerland and the Netherlands scored above the OECD average in all three tested areas (reading, natural sciences and maths). Poland and Germany scored above average in three areas and the UK and Denmark in one. In contrast, Greece, Spain, Turkey, Russian and Italy scored significantly below the OECD average in all three areas. In these five countries, total public expenditure for education (in per cent of the GDP) was under the EU average of around five per cent. Both factors – investment in education and PISA results – correlate strongly. And how do the Europeans themselves view their education system or, in other words, its viability in the future? There seem to be large discrepancies between the individual states. For example, two-thirds of Danes are satisfied – despite the fact that Denmark remained “only” within the OECD average for the large part. The majority of Swiss, too, prove to be optimistic. The Italian education system also received high marks, although the government in Rome recently pushed through a comprehensive austerity programme within the education sector – the Italian universities are the only ones which have to accept spending cuts of 700 million euros in 2011. Surprisingly pessimistic: the Dutch and Poles, whose pupils normally score above average on the PISA tests. The Greeks show the least trust – just 15 per cent believe that the Greek education system is well prepared for the future. The analysis of the phases of life shows that the youth are more likely to consider their country’s respective education system to be viable in the future. In all other phases of life, in contrast, only around one in every three believes their country’s current state education system is well prepared for the challenges of tomorrow. Large differences can also be seen in the educational background of those surveyed – with great variances within nations. While in the Netherlands, the UK and Austria, mostly those with a higher education place trust in their country’s respective education system, in the other nations surveyed, it is the formally less educated who do so. It is precisely in uncertain times that the people worry about their security twofold: fear of violence by others and fear of their own financial security. For more than one-third of Europeans (35 per cent), personal safety has now become more important than personal freedom. … Read moreAgainst this backdrop, only a few differences within the populations exist – however, there are massive discrepancies between the nations. For example, approximately every three quarters of Italians and Greeks place security above privacy. In countries with an already advanced social net, such as Austria, Germany and Switzerland, this number is only one-fifth of the population. And in eastern European countries, too, such as Russia and Poland, it is only every third citizen whose wish for security takes priority over freedom (certainly, this is also for historical reasons). At the same time, just under half of all Europeans considers their own country to be safe (48 per cent) and just as few praise the large amount of personal freedom in their homeland (47 per cent). When comparing nations, the varying degrees of agreement prove to be enlightening. Indeed, both statements experience acceptance by the majority of Danes, Italians, Greeks and Swiss, for example; however, the degree of acceptance partly shows significant discrepancies among nations. Additionally, the feeling of “security” in Switzerland, Turkey, Austria and Poland is stronger than that of “personal freedom” – a fact that is especially meaningful. For the Greek, French and Dutch, however, it is exactly the opposite: “personal freedom” takes priority over “security” more frequently. The analysis in the 13 European countries has shown: Europeans are quite aware of future challenges which their countries will be facing. Whether in the area of education or environment, security or freedom, work-life balance or child-friendliness – EU citizens see potential for improvement everywhere. 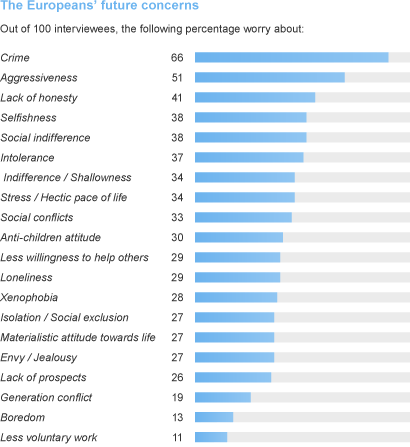 … Read moreAt the same time, however, we can also see: more than two-thirds of those surveyed are glad to live where they are currently living, despite all the problems. In Denmark, nearly all Danes agreed with this statement; and in ten other surveyed nations, at least three out of five did. Solely in Poland and Russia is a minority happy and content with life in their homeland. Satisfaction with one’s location is certainly dependent on a number of personal and general factors. However, the most noticeable factor is the particularly high contentment within individual countries (in Denmark, Italy, Switzerland, France and Greece, more than three quarters of the population) as well as the above-average agreement with the following two socio-cultural elements throughout: child-friendliness and trust in others. Accordingly, these two factors seem to be decisive characteristics for determining sentiment in each country. Two in five “Everything was better back then” – this romantic view of the past finds approval among more than two in five Europeans. We do not need to visit soldier cemeteries to dispel this myth – there are a host of arguments: Regardless of which period in history is chosen as a reference, never before has life expectancy been higher and infant mortality lower. … Read moreStandard of living has also improved, together with real income. At the same time, the number of working hours has been reduced and the number of paid holiday days has increased. Medical care has never been better, education never so widespread, communication more immediate and easy, and mobility more varied and fast. The everyday life of Europeans has continually gained in quality since the end of the Second World War – not least due to longlasting peace. In addition to the Russians and Greeks, the majority of French, Italians and Germans glorify the past – and these last three states are some of the wealthiest in Europe. Is it fear of having to share the wealth in the future or even having to pay for others’ standard of living? The fear of serving as a paymaster for others in future is widespread – after all, these three nations already contribute more funds to the EU budget than all the other 24 member states combined. But this notion is one-sided. Would Germany, France and Italy have ever been able to become leading economic markets without a decades-long period of peace in Europe? Would there ever have been so much to “inherit” and “bequeath” if inflation in Europe were not counteracted (the average inflation of the euro since its introduction in 2002 totals 1.5 per cent – in comparison, the inflation of the Deutschmark in the 20 years before the adoption of the euro totalled 2.9 per cent)? Would it not come to a sort of emigration of nations to northern and central Europe if not for the development and support measures for economically weak regions? Would – without the fact that around every fourth job is directly or indirectly dependent on exports to other countries – the unemployment rate not have dramatically risen? These select few facts alone make clear how much France, Italy and Germany have also profited from a strong and secure Europe, and how good an investment the contribution payments to the EU have been. That the youth illustrates hope for Europe is seen in the very optimistic views of life in future. The number of optimists is twice as high as that of pessimists. In contrast to the older generation, the young live in the “here and now” – and look forward to the future, which they associate with hope for a fulfilling and happy life. The National Opinion Research Center (NORC) at the University of Chicago regularly surveys the amount of national pride within countries around the globe. The top places are almost always held by the US, Australia and Venezuela – three nations whose national identity has grown through conflicts. … Read moreIn the NORC analysis, European nations, in contrast, regularly rank last – and the gap is growing quicker and quicker. Are the Europeans really no longer proud of their own countries? The fact is, only slightly more than every second European citizen (52 per cent) is proud of his or her own homeland; whereby in the young to middle-aged groups of 14 to 50, answers only marginally deviate from one other. 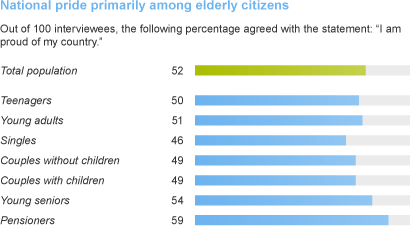 However, as age increases, so does patriotism – reaching a value of almost 60 per cent among pensioners. If the attitude of the younger generation continues, however, national pride will slip further and further and lose importance. We also see severe discrepancies within the comparison between the countries. Countries such as Denmark (86 per cent), Italy (72 per cent), Greece, France and Turkey (60 per cent each) express a stronger national consciousness. In contrast, only about every third Pole (32 per cent), Russian (34 per cent) and Dutchman (36 per cent) agree with this statement. The Germans show the least amount of national pride (29 per cent). “We are the Pope” headlines, “You are Germany” campaign, public viewing and German fan waving during the World Cup – all of these seem to have hardly left a mark, and the large majority of Germans have reverted back to their familiar patterns of behaviour. Quite aware of their historically based feelings of shame, Germans indeed long for a feeling of “we”; however, the majority do not openly express this point of view. But is the discussion of “national pride” at all still relevant in times of globalisation and Europeanisation? And what is “typically German” or “typically Spanish”, “typically Danish” or “typically Polish”? Have the high numbers of citizens with migration backgrounds in each European country, the many holiday trips to other cultures, or the same TV programmes everywhere today not also led to a merging together of Europe? And that we feel more like Europeans than Italians, French or Dutch? Can national or pan-European interests be limited simply to economic issues? And can Europe even merge together when the scepticism regarding so many issues is still very strong? It is clear: European and national interests and issues do not automatically have to contradict one another; instead, they should be closely coordinated to allow us to see the opportunities that they provide for the future. … Read moreAfter all, two-fifths of Europeans believe that a united Europe offers a diverse range of options and potential. In Italy, Denmark and Greece, even the majority of people in each country believes in the positive effects of a united Europe. In contrast, the British and Dutch cannot fully imagine the advantages of a united continent. Even the non-EU states of Turkey, Russia and Switzerland show more power of imagination in this respect. Comparing the phases of life with each other, the under-24-generation shows more acceptance than the middleaged and older generations, which coincides with the results from the main interviews with students. The future of Europe, therefore, will be shaped by the later generations to an extremely large degree. In addition to age, the level of education is also a decisive factor in favour of a pro-European view. In nearly all of the countries, the acceptance of Europe – also in terms of the opportunities available through Europe, the identification with Europe and the attitude that Europe can only succeed together – is almost twice as high among those with a higher education than those with a lower education. Thus, education seems to be a key factor in being pro-Europe. We also often see: with a higher education comes increased mobility and multilingualism – characteristics which are strengthened or supported by Europeanisation. Those particularly sceptical of Europe are the formal lower educated, unemployed or low-wage earners – people whose fear to be among the losers of a merging Europe or to fall even further in social status is particularly high. A fear that is, by all means, justified. Europe is indeed one of the world’s richest regions; however, 17 per cent – or over 100 million – of Europeans live below the poverty line and do not have enough income to meet life’s basic needs. According to the European Union, a person is considered “poor” when he is “[...] excluded from enjoying a standard of living that is regarded as acceptable in the society in which he lives”. But poverty can also be established on the basis of other criteria, such as a country’s average net income – people who earn less than 60 per cent of the mean income are considered “poor”. The actual values within Europe are very different, ranging from 158 euros in Romania to 1,375 euros in Luxembourg. Additionally, the poverty line can be determined according to the sum of all material products and goods that a person can afford. For example, every tenth European cannot afford to adequately heat his or her flat; and for just as many, proper nutrition is not affordable. With these facts in mind, the European Union officially focused on the fight against poverty and social marginalisation in 2010, creating a “European Social Fund” of 76 billion euros, to be in effect for the duration of six years. Its aim is to support projects which assist people in rising out of poverty (for example, for the unemployed in the form of further education measures which help them to re-enter the job market).